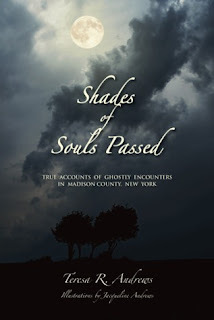 A collection of true accounts of ghostly encounters in Madison County, New York. Whether it's a malevolent poltergeist, a mischievous little girl playing hide and seek, or a gardener simply going about his business, the souls that wander the empty spaces of Madison Country remain unseen until one day, or night as the case may be, they decide to make themselves known. Whatever the case, you can be sure that when you roll over and turn out the lights tonight, you won't be the only one in your room. I love a good ghost story, so when I got the email from Teresa about the opportunity to read her anthology of true ghost encounters I had to jump on it. I couldn't wait to read what every day people discovered. Now, before I begin I must mention that in Teresa's author bio it does say that she "firmly believes a good ghost story doesn't need violence, gore, or modern day scare tactics to be suspenseful." I must say I don't completely agree with her. Yes, I completely agree that a ghostly encounter doesn't need any of those things to scare the pants of the witnesses, but if you aren't the witness and only the story hearer, they aren't that interesting. I went into reading this novel thinking that these were going to be stories that made me even more scared to walk around my old house alone. Yes, I felt a little spooked right after reading some of them, and sometimes very scared while reading them until the end of each story, but they definitely didn't linger with me after I was done reading them. They were all pretty innocent stories. Nothing terribly terrifying happened, and on some stories I felt like they were cut too short. There were two that I really felt like they were cut way too short. They were just missing facts at the end and that was Dark Night of the Soul and The Midnight Gardener. In Dark Night of the Soul I felt like Teresa should have included what the premonition was, because it started to get pretty spooky and then just ended. I feel like even when Teresa while listening she had to have asked what the premonition was. In The Midnight Gardener it never tells how the person died, and the story teller says it was obvious to her, but I didn't find it obvious at all. Maybe I missed some clue in the story, but I just didn't get it. I wanted her to tell me. It is an interesting book and it is very cool to read real ghost encounters, but I wish they would have gotten progressively scarier as the book went on. I also wish that there would have been more details in the stories as to how the ghosts came to be ghosts. Just some research and a small bio on the undead would have been nice. The stories were good, but just a little too innocent for me. I did feel a little spooked while reading each since I didn't know what was going to happen next, but once I found out the next I felt a little disappointed since I was hoping for more. If you like innocent encounters where no one was hurt then this is the book for you. If you want the pants scared off you, I would stray away.